"I ask myself, when will there be no more need for girls like us? But they keep coming, one after another." Chikamatsu monogatari (A Tale of Chikamatsu or Chikamatsu story – Monzaemon Chikamatsu is the name of original author) is tale well known in Japan, not least through its bunraku puppet and kabuki theatre incarnations, on which this film adaptation appears to be primarily based. It's not hard to see why it was handed to Mizoguchi Kenji, a man not notorious for tales in which characters live untroubled lives and for whom things work out well in the end. Mind you, even by his standards the characters here take their first steps on the slippery slope of misfortune at a surprisingly early stage. The setup is somewhat convoluted and delivered at quite a pace. In 17th Century Kyoto, the wealthy Ishun runs a successful print house whose current reputation is down in part to the genial Mohei, the company's best worker. Mohei's colleague Otama dotes on him but has her hands full fighting off the unwelcome advances of Ishun, whom she attempts to discourage by claiming that she and Mohei are engaged to be married, a pretence Mohei is just too honest to uphold. Ishun's wife Osan, meanwhile, is approached individually by her idle brother and her concerned mother for a loan to prevent the seizure of their house and imprisonment for non-payment of debts. With little chance of securing the money from her miserly husband, Osan approaches Mohei, who is also responsible for the firm's accounts, to see if he can arrange the loan for her, a favour he willingly grants. In the process of juggling the books, Mohei is caught out by fellow worker Sukeyemon, who agrees to turn a blind eye if Mohei steers some of the money his way. Mohei refuses and is promptly shopped to Ishun by Sukeyemon. With me so far? Well we're just getting started. Ishun is outraged by this betrayal of trust, but Otama, knowing nothing of the arrangement between Osan and Mohei, falsely claims that Mohei was stealing the money for her. Ishun is having none of it and orders that Mohei be locked up until the authorities can be contacted to drag him away. Osan learns the truth about her husband's night-time visits and decides to catch him in the act by swapping sleeping quarters with Otama and lying in wait for him. Instead she is visited by Mohei, who has escaped his temporary prison and come to bid Otama goodbye. When Osan reveals her identity, Mohei renews his pledge to find the money she requires, but when the two are discovered together, Ishun accuses Osan of having an affair with Mohei, who has already fled the scene. Refusing to listen to Osan's explanation, Ishun suggests that she take her own life. Instead she leaves and by chance meets up with Mohei, and despite the risk of being labelled adulterers, a crime that carries the sentence of death by crucifixion, the two go on the run, pursued by Ishun's agents with orders to keep news of the affair from spreading and harming his prestigious business. Believe it or not, this is just the set-up. It would take another couple of sizeable paragraphs to get us to the last act, a journey in which matters complicate further for Mohei and Osan and sees the weeping Otama all but drop out of the story. The characters and their arcs of fate have a familiar Mizoguchi ring, with good-hearted people falling victim to ill fortune and the self-centred whims of those in positions of authority, and in the feeling that even from the early scenes that the story is unlikely to end well for anyone. The potential fate that hangs over the fleeing Mohei and Osan is graphically illustrated just ten minutes in when the wife of a samurai and her lover are paraded through the streets and publicly crucified. Even Ishun is far from safe, as scheming business rival Isan works to use the news of Osan's supposed adultery to unseat his position of local power and influence. In the accompanying featurette, Tony Rayns makes the case for Chikamatsu monogatari as a minor Mizoguchi work that the director himself approached with something close to indifference. Mizoguchi's attitude to the project and his frequent disagreements with leading man Kazuo Hasegawa have certainly been documented in the memoirs of his colleagues, but I'd still argue that this is very recognisably and positively a Mizoguchi film, in the sense of doom that hovers over the main characters from an early stage, in its character and narrative detail, and in the way the good-hearted suffer as a result of the selfish actions of the indifferent of those in power, or, in the case of the unprincipled and ambitious Sukeyemon, those who seek to wield it. 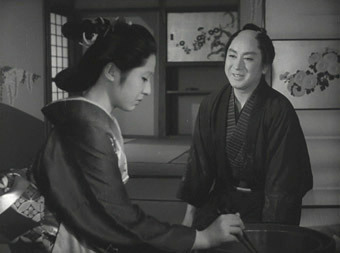 The pacing is typically brisk, perhaps more so than usual for Mizoguchi due to the density of the early plotting, and a kabuki influence is keenly felt throughout, particularly in the way action is sometimes staged within frame and location and in Hayasaka Fumio and Mochizuki Tamezô's almost theatrical score. It's likely in part Mizoguchi's lack of enthusiasm for the project that prompts the knowledgeable Mr. Rayns to suggest that his direction is somewhat academic and that the drama fails to engage as it should. I don't agree. 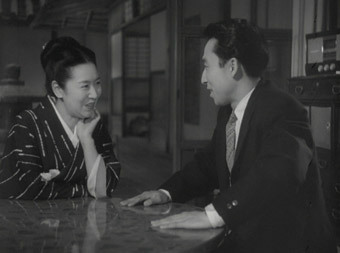 It may not have the searing dramatic power of the director's finest work, but Chikamatsu monogatari still grips in its storytelling and elicits strong sympathy for its luckless lead characters, whose moving and irony-tinged fate is sealed by their emerging true feelings for each other, which might never have surfaced had they not been accused of infidelities they never actually committed. Uwasa no onna, which translates as Gossip Woman or the somewhat more elegant The Woman of Rumour, makes an interesting and logical companion piece to Mizoguchi's Gion bayashi of the previous year. Both stories are set in contemporary Kyoto geisha houses and presented exclusively from the viewpoint of the girls working within them, while a newcomer to this world and this particular house is a main character of both films. The key difference here is that while Gion bayashi's Eiko chose to follow in her late mother's footsteps as a trainee geisha, Uwasa no onna's Yukiko, the daughter of widowed brothel owner Hatsuko, strongly disapproves of her mother's profession and arrives at the house reluctantly following her attempted suicide in Tokyo. On hand to offer help and support is young doctor Matoba, who works for the geisha guild and whom Hatsuko is attempting to set up in a of practice his own. Yukiko initially rejects the doctor's friendliness, but as the two spend more time together she starts to open up to him and a bond develops. Hatsuko becomes increasingly frustrated by their developing relationship, and it soon becomes clear that her interest the younger doctor goes a lot further than that of a business partner. There are certain inevitabilities of narrative convention here, that Yukiko and Matoba's relationship will blossom into romance and that Yukiko's hostility to her mother's line of work will mellow, but the first of these does not ultimately play out as expected and the latter develops logically as a result of, and in tandem with, the rediscovery by Yukiko of her own humanity. The catalyst for this is prostitute Usugumo, whose occupational illness turns out to be more serious than first realised and whose care Yukiko takes charge of, endearing her to the girls who had previously expressed contempt for her perceived aloofness. As with Gion bayashi, the behind-the-scenes workings of a geisha house are of particular interest, but once again Mizoguchi shows us both positive and negative aspects of the profession. The upbeat exuberance of the scenes in which the girls entertain their customers is balanced by the fate that befalls Usugumo, whose determination to keep working despite her condition is driven by a desperate financial need. This was her prime reason for becoming a geisha in the first place and the reason her sister begs to be allowed to take her place following her premature death (this also recalls Gion Bayashi, which began with 16-year-old Eiko asking to be taken on as a trainee geisha in place of her recently deceased mother). This dual view of the geisha's world was no doubt reflected the director's own conflicting experiences of the profession – although he apparently remained resentful that his sister was sold into prostitution at an early age, he was himself a frequent user of prostitutes in his adult years (as Tony Rayns points out in the accompanying address, this was in no way unusual for middle class Japanese men at this period in the country's history). 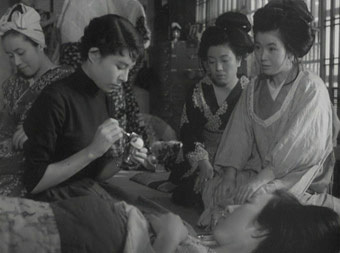 The soul of the film lies increasingly in the troubled mother-daughter relationship between Hatsuko and Yukiko, which is defined from the start by Hatsuko's profession of choice, both in Yukiko's initial hostility to her new home and in the reasons that brought her there in the first place. In their responses to each other, the two are travelling in opposite directions – as Yukiko begins to mellow to her mother and her lifestyle, Hatsuko becomes increasingly envious of her daughter's youth and her relationship with Matoba. There's a strong suggestion that she had been having a long-standing affair with the doctor until her daughter arrived on the scene, but her jealousy is further frustrated by the knowledge that it was she that introduced them to each other, asking Matoba to spend time with Yukiko in the hope of aiding her healing. It's her involvement with Matoba that earns Hatsuko the title moniker, highlighting a curious dual standard that accepts her as a brothel owner but disapproves of her relationship with a man half her age, an attitude that is brought to a head when she is publicly humiliated by a stage performance that openly mocks her desires. As with Gion bayashi, there's the sense that Uwasa no onna is regarded as the supporting feature of this two DVD set, but while it may not be up there with the director's acknowledged classics, it's still an involving and culturally intriguing film in its own right. It's also of particular note in the Mizoguchi oeuvre, being the last time he worked with favourite leading lady Tanaka Kinuyo and thematically located midway between the previous year's Gion Bayashi and his final film, Akasen chitai [Street of Shame], which is also to be released on UK DVD by Masters of Cinema. Both films are framed in their original aspect ratio of 1.33:1 and have clearly undergone restoration. The detail and contrast on Chikamatsu monogatari is generally first rate, while dust and damage are rarely even visible and never obtrusive when they are. There is a very slight flicker to the picture in places and some variation in contrast levels and black levels, which are rarely solid in darker scenes, but this is never distracting. Uwasa no onna fares slightly less well, with damage a little more evident beneath the clean-up and occasional minor picture jitter and a wider variance of contrast solidity. Detail is good, however, and when the contrast is right the transfer is very pleasing. The mono Dolby 2.0 sound on both films is about average for a Japanese film of this vintage, with dialogue and music clear enough but usually subject to a little background hiss and crackle. This only occasionally becomes intrusive in Chikamatsu monogatari, but is more prominent in Uwasa no onna. Renowned expert on Asian cinema Tony Rayns provides some useful background to the production, including a detailed biography of Chikamatsu Monzaemon, on whose story the film is largely based. He also fills us in on Mizoguchi's apparent lack of enthusiasm for the project and speculates on the reasons, and clearly regards the film as one of the director's lesser works, a point on which we differ. Also included are the original teaser (2:06) and the original trailer (3:51), neither of which are in sparkling shape, but then it's a small miracle they've survived at all. The teaser is of particular interest for its brief behind-the-scenes footage and its claim that the film is "the acme of cinematic perfection." Mr. Rayns discusses Mizoguchi's attitude to the project, which was again apparently unenthusiastic (fascinating and useful though Rayns contributions are, you have to be careful what you quote for the sleeve notes if you wanted to sell the DVD). He also profiles lead actress Kinuyo Tanaka, with whom Mizoguchi was apparently infatuated, and tells a most interesting story about how the two parted company. Again we have the original trailer (3:51), which is in similar condition to the above. Another excellent Masters of Cinema publication, although there are more inclusions specific to Chikamatsu monogatari than Uwasa no onna. Mark le Fanu's typically detailed analysis of the former holds Chikamatsu in higher regard than Tony Rayns, describing it as "beautiful and classically crafted." He provides a breakdown of some of the differences between the film and the play (a running commentary I received on my first viewing with a Japanese friend), as well as a persuasive argument of the film's unique strengths. You can make your own comparisons to the source material with the aid of English translations of Ihara Saikaku's 1686 What the Seasons Bought the Almanac Maker and the opening section of Chikamatsu Monzaemon's The Almanac of Love. An extract from Keiko L. McDonald's long out-of-print book Mizoguchi concentrates on Uwasa no onna, which the article regards as some way from the director at his best. Although neither of the films here have achieved the classic status of the director's finest work, both are most worthy of the attention of any fan of Japanese cinema and particularly the films of Mizoguchi Kenji. They mirror well the first Masters of Cinema release in this series, pairing a tragic historical tale with a contemporary geisha drama, and are well presented for this DVD set, the Tony Rayns' contributions and the excellent booklet complimenting well the generally fine (if a little variable in places) transfers.